Regular events in the Village Centre: I thought this might be a useful list – copied from the What’s On page of Hurst Life: Sunday afternoon 2 pm to 4.30 pm, Tea Dance, nearly every Sunday. Sunday, 9.30 to 10.30, Weight Watchers, in the Club Suite. Monday, 9.30 to 11.30, The Sanctuary. Weekly during term time – a welcoming place where friendships can form over coffee and cake. Tuesday, 3.30 pm to 5 pm. Yellow Brick Lab, term time. Second Tuesday, 2 pm to 4 pm. Knit and Natter. Third Tuesday, 7.45 pm, Club Suite Wolstonbury WI. Friday, from 6.45 pm weekly, Star Dance School. Hurstpierpoint Players: regrets that owing to cast illness the production of Rope has had to be postponed. This show will now run from Tuesday 30 April until Saturday 4 May. All tickets purchased for the original dates are now being refunded in full (cash purchasers should call at the Box Office with their tickets). Customers who would like to buy tickets for the same seats on the same day of the week (30 April-4 May) should contact the Box Office before Monday 8 April. Customers not wishing to re-book do not need to take any further action. Tickets for the new dates will go on open sale on Monday 8 April. Rope, is by Patrick Hamilton and directed by Jo Kearns. For the sake of adventure, danger and the ‘fun of the thing’ Wyndham Brandon persuades his weak-minded friend to assist him in the murder of a fellow undergraduate. They place the body in a chest and then invite people to a supper party using the chest as the dining table. Welcome to new Funeral Director, Freeman Brothers, at the Hassocks end of the High Street. That completes the row of businesses that end of the road joining Fabulous Floors, Sussex Living, Farringdons, the Bridal Shop, Ruby Watts, the Nupur Tandoori and the Fig Tree Restaurant. If you’re not in the habit of going that far down the High Street, do go and have a look in all their windows. The other side of the road hosts Feathers fashion shop and Frank Davey Funeral Director. We are so fortunate to have such a wide variety of shops and businesses. We were sorry to see Muddy, the lovely china shop close. It’s up to all of us to make sure they flourish. Hurst Singers has closed down: after 68 years of giving pleasure to audiences in the village and beyond. David Redd reports that dwindling numbers and illness led to this decision. He thanks all the people who have been members of the choir and the hundreds of people who have supported concerts for many years. Members are now joining other choirs including Burgess Hill Choral Society, Chanctonbury Chorus, All the Right Notes, and Sussex Chorus, all of which have concerts between April and June. Thank you, Hurst Singers, for so many years of giving pleasure to the rest of us. Hurst Players: are launching ‘The Big Push’ to raise the rest of the funds needed to upgrade and refurbish the Players Theatre in the High Street. It is a wonderful asset to the village and often the first experience of live theatre for young people in the form of the annual pantomime. The Players put on productions of all sorts throughout the year and the Theatre also hosts the brilliant Village Cinema, all sorts of Festival events, and many other cultural happenings throughout the year. Hurstpierpoint is very unusual in that we have our own purpose built theatre. It will be even better when the work is done. If you can help in any way, or would like to know more about the plans, please contact Richard Coney, who is leading the fundraising efforts, on :- coneys@talktalk.net or 01273 835128. Congratulations: to Paul Wilkinson for his amazing achievement in raising £7,000 for The Chestnut Tree House Team Daisy, in memory of Daisy Bushnell. He collected 520 Christmas trees from households in the village and surrounding area in exchange for a donation. I thought last year’s total of £6,600 must be the most he could raise, but once again he exceeded expectations. Paul says he is overwhelmed by how much this grows each year. If you didn’t ask Paul to collect your tree this year, do remember it next year. We are very proud of you, Paul. The Hurst Monthly Social Group: is a new group for members to meet up, learn and share knowledge in a social setting. We will be meeting on the 1st Wednesday of each month from the 6th February 2019 from 2.00 to 4.00 at the Guide Headquarters, Trinity Road Car Park, Hurstpierpoint. The first speaker is Mak Norman who is talking on Anglo Saxon History and on the 6th March we have Ian Gledhill on Art Deco. The first two meetings are free after which there will be an annual membership fee. Tea coffee and biscuits will be provided, we have a varied and interesting schedule planned for the year and hope both men and women of all ages will come and join us. Contact Dianne on 01273 835284 or Ann on 07806 670359 for details. The Hurst Monthly Social Group is a new group for members to meet up, learn and share knowledge in a social setting. 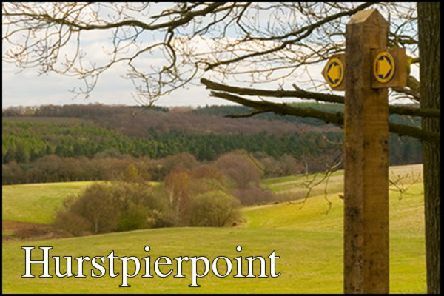 We will be meeting on the 1st Wednesday of each month from the 6th February 2019 from 2.00 to 4.00 at the Guide Headquarters, Trinity Road Car Park, Hurstpierpoint. The first speaker is Mak Norman who is talking on Anglo Saxon History and on the 6th March we have Ian Gledhill on Art Deco. The first two meetings are free after which there will be an annual membership fee. Tea coffee and biscuits will be provided, we have a varied and interesting schedule planned for the year and hope both men and women of all ages will come and join us. Contact Dianne on 01273 835284 or Ann on 07806 670359 for details. Happy new year to everyone: and thank you for all the contributions throughout last year. Please keep them coming. Saturday 8 December, Hurst Traders Christmas: What a marvellous afternoon and evening, despite the rain! Hundreds of people turned out in the High Street and enjoyed the festivities and the shopping opportunities. Thanks and congratulations to all the traders and the team of organisers. Saturday 8 December, Hurst Traders Christmas: 3 to 7 pm in the High Street. Come and support our wonderful traders and stock up for Christmas! All sorts of enjoyable events including Santa’s Grotto, carol singing, a Live Nativity in the Bus Shelter (if you feel like dressing up as a shepherd, an angel, or a king, do please come along and join in at 4 pm. Carol singing starting outside the New Inn at 3.30 pm and then processing up the High Street. Saturday 1 December, 10 am to 12 noon, Guide HQ, in the back corner of Trinity Road Car Park: Christmas Bazaar - the Guides, Brownies and Rainbows have been busy preparing items for their Bazaar. Do come along, have a coffee and mince pie and browse the many stalls. Entrance adults £1 and children free (includes your coffee& mince pie). All welcome.